The Little Red Book debuted in 1964. Known for its bright red cover, the publication was available in 32 different sizes – the most popular being a small, pocket-sized version. 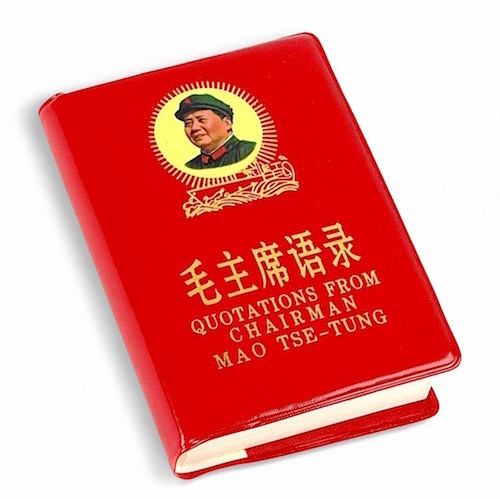 The official name of the book was Quotations from Chairman Mao Tse-tung who, from 1943-1969, was the Chairman of the Communist Party of China. Filled with excerpts from Chairman Mao’s speeches and writings, the book includes subjects as diverse as: class struggle, war and peace, patriotism and relationships between the army and the people. All Chinese citizens were expected to own a copy of the book and most saw it as a form of protection during the controversial social-political Cultural Revolution (1966-1976). It has been estimated that over one billion copies have been produced. Red is a powerful color, one that China has a long history of embracing. Several early Chinese emperors followed the “Theory of the Five Elements” (wood, fire, earth, metal and water) and their individual color associations to determine how to promote their dynasties. Red is the color of fire, an element that evokes warmth, aggression, passion and joy. For Chairman Mao, red was the color of the communist revolution, symbolizing the blood shed for the cause. In 1949 the flag of China, the red rectangle with yellow stars, was adopted and red became the color of the nation – its people and the government. No wonder the Little Red Book is so iconic, the color alone is rich with meaning.